The region of Bačka (German: Batschka, Hungarian: Bácska, Serbian: Bačka) is bordered by the Danube to the west and south, by the Tisza in the east. To the north there is no natural border, the region ends between the cities of Baja and Szeged. Almost ninety percent of the historical Bačka belong to Serbia today, the smaller part lies in Hungary. Within Serbia, the region, which was first mentioned in the Treaty of Karlowitz in 1699, is nowadays part of the province Vojvodina. Bačka was settled by Germans in the second half of the 18th century. After the military institutions along the border between the Habsburg Monarchy and the Ottoman Empire had been dissolved, Bačka came under the rule of the Hungarian Court Chamberlain’s Office. Up until then, the region’s swampy grounds were mostly used by Slavic farmers for pastoral economy. This was changed by the Court Chamberlain’s settlement policy: The Magyars, Slovaks, Czechs and Ruthenis from the North as well as the Lorrainers and Germans knew modern methods of agriculture and thus pushed the Slavic population away. For agricultural success, the soil was drained, a system of canals and new transport routes built. The Germans came from the south-western regions at the upper Rhine, from Franconia, Hesse, Swabia and Pfalz, a typical migration-region. Bačka turned into one of the main settlement areas for Danube Swabians. The city of Apatin on the shore of the Danube was with 14.000 Germans one of the largest Danube Swabian settlements in Yugoslavia before World War II. The German settlers soon promoted the development of Bačka’s natural landscape and historical settlement structure. They established a market-oriented economy of agriculture, craftsmanship and industry which significantly increased the wealth of the region. Typical agricultural products of Bačka were corn, wheat and hemp-, forage-, food- and industrial plants which were harvested on the wide plain. Bačka, along with Banat, was called the corn chamber of the Habsburg Monarchy. After World War I, large parts of Bačka were given to the Kingdom of Yugoslavia in the Treaty of Trianon. In the interwar period, the Swabians of Bačka were economically successful – for example with their cooperative Agraria. In political terms, several interest groups were formed of which the national-socialist “Reformers” were predominant from 1938 onwards. After the end of World War II, many Swabians fled to Germany. In 1944/45 the whole of the German civil population of Bačka – as well as other parts of Yugoslavia – was collectively disowned and interned in death camps. 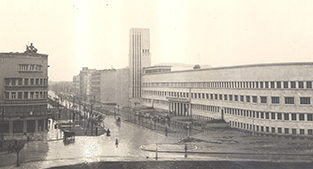 The government buildings of Danube Banovia in the 1930s – the building is still seat of government today. 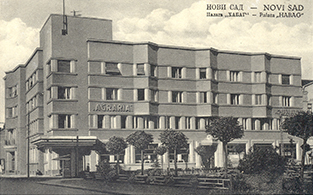 “Habag“ Palace – seat of the agricultural credit union “Agraria”. 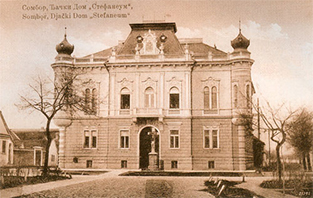 Novi Sad at the turn of the century.